I guess that anyone who wants to experiment baking cakes won’t miss to try the upside-down cake. It’s very simple to get it done with good results easily. 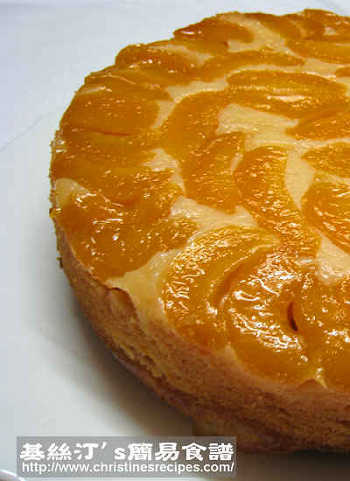 You can replace apricot with any kind of fruit you like. Sounds good? My daughter has a sweet tooth and keeps requesting a piece of dessert after dinner. So I have to control her sugar intake. Normally I won’t bake a cake using excess sugar. However you might like to double the amount of caster sugar used in this recipe, or adjust to your taste. Preheat oven to 180C. 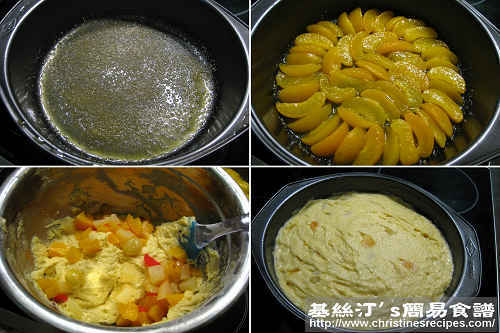 Prepare a 20cm round non-stick cake pan. Melt 30 gm butter. Drizzle evenly over pan base, and sprinkle with brown sugar. Spread apricot evenly on pan base, cut-side down. In a large bowl, using an electric mixer, cream chopped butter, caster sugar and vanilla, until pale and creamy. Add the eggs one at a time, and mix until just combined. 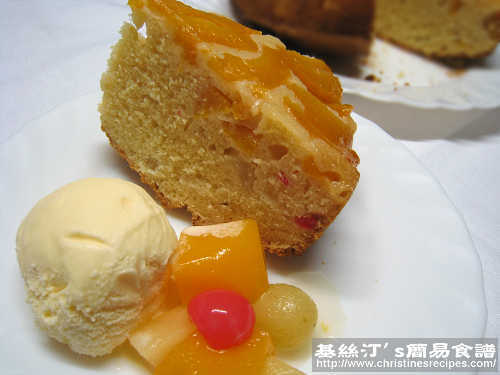 Fold through flour and assorted fruit. Spoon mixture over apricots, smoothing top. Bake for 50 to 60 minutes, or until cooked when tested. Serve warm, cut in wedges, with vanilla ice-cream. Lovely recipe. Cake turned out perfect! You can use 1½ cups of all-purpose flour with 2 teaspoons of baking powder and 1/4 teaspoon of salt.